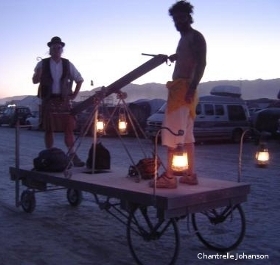 The Clockship Kalamazoo is a railroad-style handcar built for Burning Man 2010. It is based on a wood platform with room for two operators who pump the main drive arm. This rotates a crankshaft, connected to a differential which then powers the front wheels. Steering is accomplished via a lever which the rear driver operates. In keeping with the rustic look, lighting is limited to four kerosene lanterns. Detailing on the C/S Kalamazoo includes custom wrought iron on the pump arm supports, lantern hooks and mounting rails at the front and back. A motif of spirals and iron twists is maintained throughout. There is also an etched brass builder's plate commemorating the Cascadian origins. A series of upgrades to the Kalamazoo was undertaken in 2011, and it made a triumphant return to Burning Man where it circumnavigated all of Esplanade over the period of 7 hours. In 2012 the Kalamazoo made an appearance at the Seattle Mini Maker Faire, the Kitsap Mini Maker Faire and the Fremont Solstice Parade. Copyright 2010-2019 Attoparsec.com. All rights reserved.